Digital riflescope Digisight N550 is a perfect combination of the latest developments in the field of optics and electronics. Along with good optical characteristics (fast aperture focusable lens 50 mm 1.0, 67 mm eye relief) the riflescope features a wide range of options which allow it to be tuned to one's personal needs. The riflescope uses a highly sensitive CCD array (with a range of operation illumination 0.00003 - 30000 lux), image is transmitted to a VGA display, 640x480 pixels. The Digisight N550 also has Sum Light function which automatically increases CCD array sensitivity under low light conditions. The screen displays information on operation status (running time, low battery indicator, camera operation mode). One of the remarkable features is the possibility of zeroing the riflescope not only in the traditional manner but also using a new one shot zeroing method. This makes the zeroing procedure significantly faster and more convenient. The Digisight N550 has several switchable pre-loaded reticles of various shapes. Apart from this, the user can upload optional reticles. Reticle inversion (color change from white to black and vice versa depending on the target colour) and enhanced contrast function are very useful too. 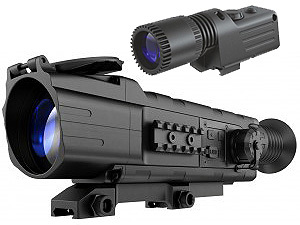 The riflescope is equipped with a built-in IR Illuminator which should be used in low light conditions in the nighttime. The Weaver rail on the side of the body allows an auxiliary, more powerful IR Flashlight (please refer to section Accessories) to be attached. Basic control functions (switching on/off the riflescope and the IR Illuminator, reticle inversion) can be performed with the help of the included remote control. The riflescope also features a jack performing two functions  Video Out (to conduct video recording to external devices without the use of additional adapters and camera or camcorders) and Video In (can be used to display on the riflescopes screen information transmitted from remote cameras via radio channel). The Digisight N550 is resistant to bright light exposure and features excellent operational characteristics. Nitrogen-purged optical channel allows the use of the Digisight N550 in rapid temperature drop conditions (inner cavities and optical parts do not become misted if the riflescope is brought from a warm room to a cold environment and vice versa). The riflescope can be mounted on a wide range of hunting weapons including those of large calibers (shock resistance is guaranteed if cartridges with muzzle velocity not exceeding 6000 Joules are used). The riflescope operates on four rechargeable batteries but can also be powered with an external power supply. Digisight N550 is designed for hunting, sports shooting, night video recording, and general observation. This Kit includes the Pulsar Digisight N550 Night Vision Digital Weapon Scope plus the Pulsar 940 IR Flashlight and free Delkin AA Quick Charger.